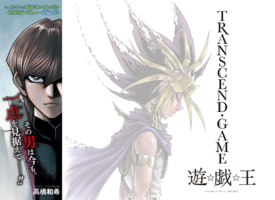 "TRANSCEND GAME" (ＴＲＡＮＳＣＥＮＤ・ＧＡＭＥ（トランセンド・ゲーム） Toransendo Gēmu) is a special two-part story in the Yu-Gi-Oh! manga. It serves as a link between the end of the manga and the film, Yu-Gi-Oh! The Dark Side of Dimensions.